These Reversible Fingerless Gloves are fashionable and FUNctional! Perfect for those chilly Michigan State football games or a Michigan State fan. Show your MSU team spirit with this pair of 4 in 1 Reversible Gloves: 1-Solid white fingerless glove with green Michigan emblem reverses to solid green side. 2-Find the hidden mitten between the layers for warm-up mitten. 3-Join fingerless gloves together to create a muffler. 4-Push fingerless glove down for wrist/arm warmer and clap for your team! The Reversible Fingerless Gloves are made of premium fleece (U.S.A.) and patterned fleece and suede cloth (Imported). 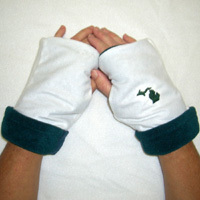 These Michigan Reversible Fingerless Gloves are fashionable and FUNctional! Perfect for those chilly University of Michigan football games or a Michigan fan. Show your Michigan team spirit with this pair of 4 in 1 Reversible Gloves: 1-Solid blue fingerless glove with Michigan emblem reverses to solid maize side. 2-Find the hidden mitten between the layers for warm-up mitten. 3-Join fingerless gloves together to create a muffler. 4-Push fingerless glove down for wrist/arm warmer and clap for your team! The Michigan Reversible Fingerless Gloves are made of premium fleece (U.S.A.) and patterned fleece and suede cloth (Imported). 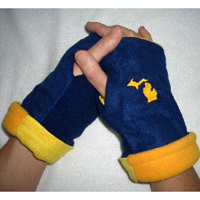 Buy Michigan Reversible Fingerless Gloves Here!